After World War II, Japanese Americans in Hawai'i sought to carve a positive niche of public citizenship in the community. 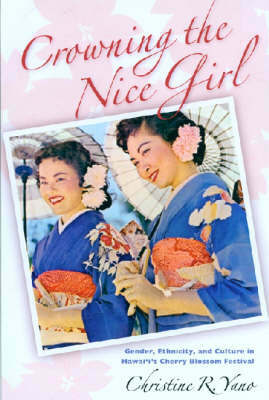 In 1953, members of the Honolulu Japanese Junior Chamber of Commerce and their wives created a beauty contest, the Cherry Blossom Festival (CBF) Queen Pageant, which quickly became an annual spectacle for the growing urban population of Honolulu. ""Crowning the Nice Girl"" analyzes the pageant through its decades of development to the present within multiple frameworks of gender, class, and race/ethnicity. Drawing on extensive archival research; interviews with CBF queens, contestants, and organizers; and participant observation in the Fiftieth Annual Festival as a volunteer, Christine Yano paints a complex portrait of not only a beauty pageant, but also a community. The study begins with the subject of beauty pageants in general and Asian American beauty pageants in particular, interrogating the issues they raise, embedding them within their histories, and examining them as part of a global culture that has taken its model from the Miss America contest. Yano follows the pageant throughout the decades into the 1990s, adding corresponding ""herstories"" - extensive narratives drawn from interviews with CBF queens. She concludes by framing issues of race, ethnicity, spectacle, and community within the intertwined themes of niceness and banality.